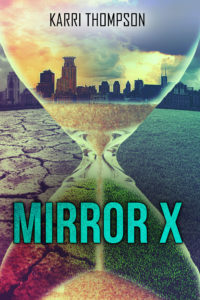 Mirror X, Karri Thompson’s first novel in the Van Winkle Trilogy, and winner of the 2015 San Diego Book Awards Best YA Published Novel. 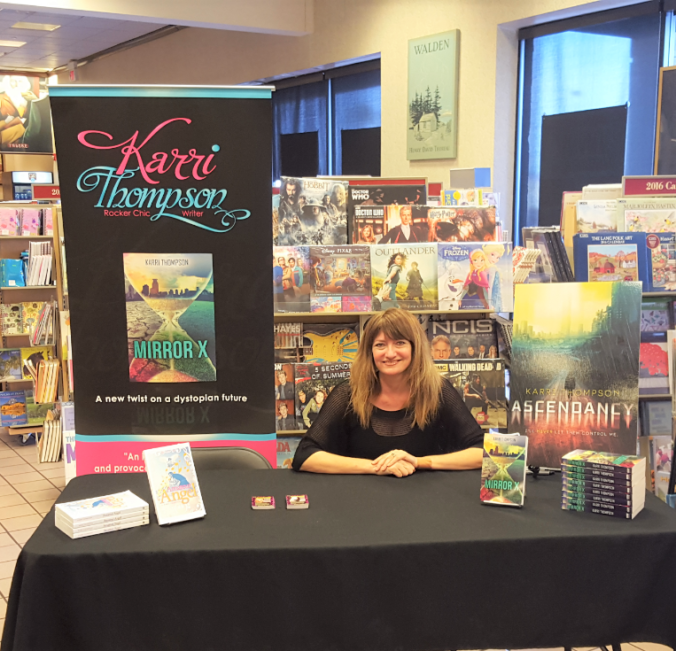 In 2015, the San Diego Book Awards gave the Best YA (Young Adult) Published Novel award to Karri Thompson for her novel, Mirror X, which enjoyed tremendous success. When you submitted Mirror X to the San Diego Book Awards, you must have known you were competing against many other talented authors. How did it feel when you learned you had won the award? I was so excited! I couldn’t believe it. I quadruple checked the SDBA website to make sure I’d read the results correctly. They were posted in the San Diego Union Tribune a couple of days later. I remember looking at the paper and telling myself: Yes! You really won! I was in tears. It is such an honor. You’ve been writing for many years now. What drives you to spend the countless hours it takes to create and craft your stories? Writing is my passion. When I write, it takes me to the scene I’ve envisioned in my head. I get to create people from scratch, their personalities and appearance, and I can make them do whatever I want. It’s playing make-believe on paper, and I love that. And in the end, I get to share the story and characters I’ve created with those who want to read them. That makes it extra special and worth every bit of my time. What themes tend to appear throughout your work? Do you have any message you try to convey to your readers? Perseverance, integrity, selflessness, and accountability are just a few of the themes in The Van Winkle Trilogy. Cassie, the main character, is a naïve seventeen-year-old girl forced into a future in which she is the key to the survival of humankind. It is a huge responsibility for a young girl. Through hardships and determination, she learns to stand her ground and take back the freedoms she’d lost. In all of my novels, the main characters tend to be inexperienced and unworldly, and through the course of the novel, gullibility is eventually replaced with prudence, and innocence exchanged with enlightenment. Moral growth is very important to me. When you write a novel, do you plot out all the scenes and action beforehand, or do you find the novel takes on a life of its own as you write? I’m definitely a pantser (write by the seat of my pants) and not a plotter. I come up with how the story will begin and how it will end. I write the first sentence, something clever to draw the reader in, and go from there. The story drives itself, changing from the initial outline in my head, as each stage of the plot develops, and my character’s personalities blossom on the computer screen. I hope I will always be able to write this way. I know authors who outline every chapter before they begin to write. That would be extremely difficult for me because I rarely know the climax of the story before I start. Was the Van Winkle Trilogy an idea that grew out of Mirror X, or did you know from the start that Mirror X would be the first of three planned novels? I always knew it would be a trilogy. Since I am a pantser, I had the basic plot for the first book already worked out in my head but not for the other two until I was getting ready to write them. The title of Mirror X was originally The Van Winkle Files. My publisher changed it to Mirror X and decided to use The Van Winkle Project as the series name. Most writers are avid readers. Is there a favorite author of yours? How about a favorite novel? Charles Dickens is my favorite author. He was a master when it comes to descriptive writing. His use of metaphors, similes, and powerful adjectives added a rhythmic quality to his works. Word choice and substandard dialect enhanced the mood of each scene while developing his characters. Great Expectations is my favorite novel. The Lord of the Rings trilogy comes in at number two. What do you like most about the YA genre? What makes it special for you? As a high school English teacher, I am around high school students six hours a day, one-hundred-and-eighty days a year, so writing YA is a natural choice. I see the challenges and struggles teens go through, not only at school, but at home, and the lack of good role models and the addition of bad influences often leading to the making of bad choices. The characters I create have plenty of their own issues, but they also persevere, learn from their mistakes, and help others. If the characters in my books can fill at least one reader with hope, inspiring him or her to not give up and do what he or she knows to be right, there would be no greater satisfaction than that. As far as the mechanics of writing, do you favor longhand, dictation, or the computer to write? I use a computer when I write. Sometimes I’ll wake up in the middle of the night with an idea for a scene. I’ll grab a piece of paper and write it down, but other than that, I type everything. I have trouble reading what I write by hand. I get a D for penmanship. Are there any particular types of scenes you find more challenging to write than others? For example, action scenes versus love scenes, dialogue versus narrative? I find love scenes more difficult than any other, especially since my characters are completely inexperienced when it comes to love and romance, and they don’t go any farther than kissing. I imagine the characters making out and do my best to recreate the scene as vividly on paper, but I always feel like I’m overusing the words: lips, mouth, kiss, touch, chest, and heartbeat. I guess there is only so much one can write when the make-out session is limited to hands above the waist. Lol. Mirror X, along with all your novels, has been well received on Amazon, achieving a 4.1 Star rating with over 83 customer reviews. How do you deal with reviews, both good and bad? A fellow author told me a long time ago not to read reviews for two reasons: they make you feel like crap, and there’s no point in doing so. Everyone gets bad reviews. It doesn’t matter who you are. New York Times bestsellers get bad reviews. Books that are made into movies get bad reviews. And after you read a bad review, it’s not like you can go back and make changes to the book based on the review, so there’s no point in evaluating negative feedback. Right? It makes sense, and I should follow that advice. Nonetheless, I’ve still looked at them. I just have to remind myself how subjective this business is and remember the books I’ve read and didn’t care for, and how those same books were loved by so many others. You have a BA in English and a Master’s in education and have been teaching at the high school level for many years now. In your opinion, how does today’s younger generation relate to the literary tradition? Do you feel literature is more, or less, relevant anymore? Unfortunately, reading is no longer the number one form of entertainment like it was in the nineteenth century. My publisher once said that an author’s competition isn’t another author. It’s movies, video games, Netflix, YouTube, social media, cell phones, etc. And it’s true. Only a handful of my students read for pleasure. In their free time, they watch Riverdale, play Fortnite, or Snapchat a friend. I do my best to share my love of reading with my students. I can only hope it is having an impact. You have been extremely active promoting your work, with nearly 50 appearances at book signings and author events held at Barnes and Noble, Warwick’s, Mysterious Galaxy, book festivals, library events, radio, and television. How do you feel about book promotion in general? Any interesting or memorable encounters with fans you’d like to share? I love promoting my work through personal appearances rather than pushing it out through social media. There’s nothing like interacting with readers and participating on author panels, so I can share my experiences and advice with others. I’ve participated in books signing events with some pretty well-known authors like Nora Roberts and Sylvia Day. There is nothing like being with a group of people who share in your passions for reading and/or writing. 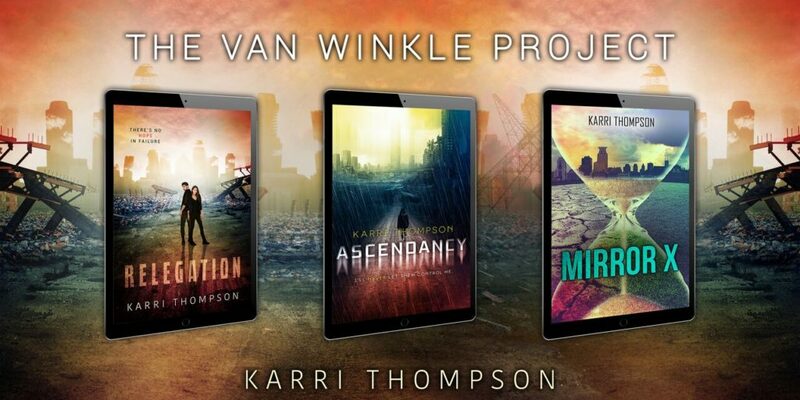 Your trilogy, the Van Winkle Project, started with Mirror X in 2014, followed by Ascendancy in 2015, and you have just published Relegation this year, finishing the series. After all the years creating and living with your characters, how does it feel to have it end? I was in tears when I typed the last sentence of the first draft of Relegation. It was really strange to have this world and Cassie’s adventures come to a close. But at the same time, there is special satisfaction in knowing Cassie’s story, her journey, her mission, is complete and preserved, so anyone who wants to can read it and join her on her quest. It was time for her story to end. Cassie did everything she set out to do, but I’ll still miss writing through her point of view. What can readers expect from Karri Thompson in the future? Any secret projects in the works? I just finished a contemporary YA set in Munich, Germany. Fingers are crossed it will get picked up by a publisher. You never know in this subjective industry, since much of a publisher’s acquisitions are based on trends and the market, which changes all the time. I’ve also started another contemporary YA, but I’m only at 4,900 words. All of Karri Thompson’s novels can be found on Amazon, Barnes & Noble, and local bookstores.